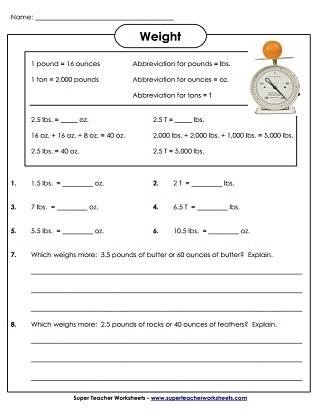 These printable measurement worksheets will help students:� measure the weight of objects in standard or customary units (pounds, ounces, and tons), estimate the weight of objects, and convert weights from pounds to ounces. Choose the best weight estimate (lbs., oz., and tons) for each of the nine pictures shown. Convert to and from pounds and ounces and tons. Convert to and from tons and pounds and ounces. Includes half units. 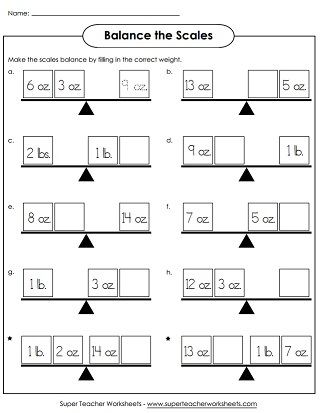 A set of word problems that require students to convert weights from oz to lbs and lbs to oz. 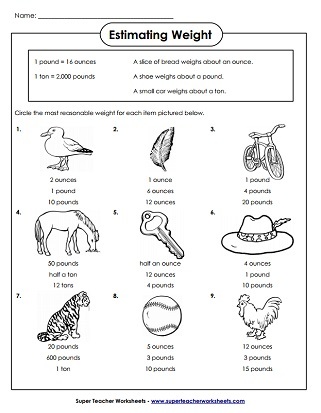 A more challenging set of word problems related to measuring weight. Determine the correct weight amounts (lbs. and oz.) to make the scales balance.